Not a hope in hell. Might get 7 or 8. Agree. It’s an ambit claim that will come down to something still too high. Is this a joke. What are you smoking Glen Eira because I want some. That may be the reason why the Camden Ward was not included in the so called discredit oh discretionary limits to allow sky is the limit. The residents are asking where is Delahunty? Where is lobo? Lobo will save us ! Has anyone seen the plans and is it all aged care or include a palliative care section? Here’s another hairbrained Magee election ploy – let’s waste half a million or so on lawyers for a supreme court appeal. Gosh, I forgot, it’s not his money. Michael Deidun yet again. Note how he has completely mischaracterised the purpose of GRZ, ignored the strategic work underpinning Glen Eira’s housing policies, failed to deliver diversity. Launching a Supreme Court appeal is likely a waste of time unless somebody can demonstrate a breach of law. Unfortunately the execrable planning system we have in Victoria means the unelected politicians at VCAT can do pretty much as they like. Planning law is about process, not what the decision should be for any given application. I think this may be connected with the on going care Calvery Health delivers to people suffering from Motor Neurone Disease. It is a very unpleasant way to die. People need a lot of support towards the end. Calling it a Retirement Village may be a way around the planning laws or maybe a poor description. 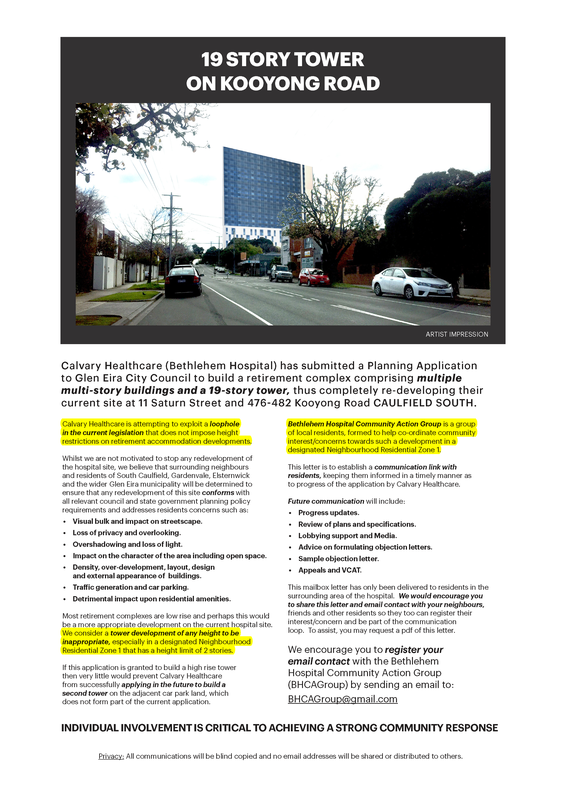 One would doubt that Calvery Health has the capacity to build a 19 storey building. Everyone would agree that our State needs a facility like the one being proposed but NIMBY. Tell the people that live near Cabrini in Malvern. “Integrated Health and Retirement Precinct” isn’t a defined land use term, so hard to say whether it is indeed exempt from height limits [eg if it is a Retirement village], or height limit applies [eg it is a Residential building]. Proposal fails to meet most of the purposes of NRZ, possibly squeezing in under the “limited range of other non-residential uses” catch-all. The Decision Guidelines [sic] are as always useless since they provide no guidance. Proposed design makes no attempt to avoid being visually obtrusive; the scale and intensity of the development is off the chart compared to the surrounding low-rise residential area; the design, height, setback and appearance of the proposed buildings are incongruous when considering the 8m height limit surrounding residents are expected to comply with. Council/VCAT/Minister can still grant it a permit. Perhaps in the future anybody who is retired or aged can avail themselves of the same non-residential loophole if they choose to redevelop their land in NRZ, just describe the proposal as “Retirement village” and refer to the precedent. I don’t think anyone would begrudge Bethlehem a new facility. It is old and needs upgrading. 19 storeys is another matter especially in its residential surrounds. I think this is outrageous, this will be cash-cow for them, so they say get stuffed to all the residents. As far as I am concerned Calvary Healthcare can stick their grandiose plan in the same place as their over priced colonic irrigation services, its a crap idea. If Calvary Healthcare thinks 20 floor high rise is the best way to deliver their health care services. They should think again. This looks like a developer’s plan for profit, not health care. The managers with the responsibility here, should think again, this is the direct opposite to providing good health care and a workplace environment. It a shame to see such crimes being fostered on the community and the poor buggers that will end up in this sterile concrete McDonald’s profit machine. Found the following in Council’s 22.02 Non Residential Uses in Residential Zones Policy under Siting and Design: “Performance Measure…Any buildings are not greater than the mandatory maximum height specified in the relevant residential zone applying to the subject land”. So we have height limits for residential buildings and dwellings, and strongly worded policy constraining buildings for non-residential uses, and nothing for certain exempt categories of Accommodation. Jeff Akehurst’s legacy lives on. Oh shocking !!! What on earth is happening to our suburbs. Corruption and greed seam to be standard in Melbourne now. And where is the infrastructure to cope with this monster??? Stuffing the city hasn’t worked and it won’t magically work now.